“Why did God allow this to happen?” This is often the question that runs through the minds of family and friends when tragedy occurs. To some, it sounds too hideous to say something like, “God killed your son,” when a child is killed in a car accident. So they euphemistically say that God “allowed” the child to die such a death. But can a logical mind make any distinction between the two? Ours do not and we doubt if yours does either. 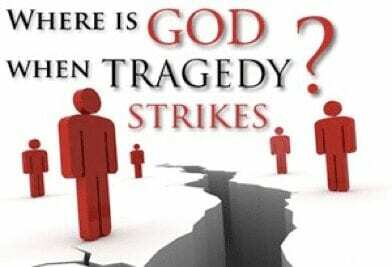 If God could have stopped it, but instead allowed it, He necessarily shares the responsibility for the tragedy. Suppose you are sitting in a restaurant visiting with two friends, Bill and Joe. Bill sees a guy with a lead pipe in his hand sneaking up behind you. He turns to Joe and asks, “How’s your family?” When you wake up, don’t you think you will blame Bill almost as much as you blame the guy who hit you with the pipe? Who can truly love a God who causes suffering or one who could stop it, but just decides to “allow” it to happen? To say that God cannot always stop evil flies in the face of many Christians’ fatalistic concept of “the sovereignty of God,” a phrase, by the way, not found in Scripture. To most Christians, this means that God is ruling over everything that happens and is thus responsible for it all. Most Christians have also been taught that God is “omnipotent,” which according to Webster’s actually means “all powerful.” Obviously God does not have all power because Satan also has plenty. We believe that most Christians use the term “omnipotent” to mean that God has the most power and, therefore, can do whatever He wants. Although we certainly believe that God is the most powerful, His Word shows that He cannot always do whatever He wants whenever He wants to. Clearly, He has limited Himself in His Word as to what He will and will not do. (12) But when this priest [Jesus Christ] had offered for all time one sacrifice for sins, he sat down at the right hand of God. Because the Lord Jesus is now waiting for his enemies to become his footstool, it is obvious that they are not yet under his subjection. But God is the most powerful and most wise one in the fight, and that means that human history as a whole will be resolved according to His will. The “whole” will be made up of the parts of human history—individuals—who chose to believe God’s Word and do His will. In regard to God’s eventual victory, consider the analogy of a chess match between former World Chess Champion Bobby Fischer and the president of a high school chess club. Although the latter might capture a few of his opponent’s pieces and perhaps, to an untrained eye, even appear to gain the upper hand at some point, the outcome is never in doubt. No matter what the lesser player may do by the freedom of his will, the master player always has a superior strategy that will result in ultimate victory. Likewise, God need not stoop to manipulating His opponent in order to achieve His goals. Hearing that God is not controlling everything that happens may at first cause some Christians great consternation and even feelings of helplessness. Perhaps this is because they have actually trusted more in fatalistic pre-determinism than in the love, power, ability, resourcefulness, and willingness of God to keep His promises regarding the present and the future. Also, this truth “ups the ante” in regard to the importance of one’s personal choices in response to God’s directives. Which sounds best to you? When properly understood, this truth will for you result in greater love for God, greater hatred for the Devil, and greater desire to obey God’s wonderful Word, which contains “…everything we need for life and godliness…” (2 Pet. 1:3).